Intro: For the first time in a generation, NASA is building a human spacecraft for deep-space missions that will usher in a new era of space exploration. A series of increasingly challenging missions awaits, and this new spacecraft will take us farther than we’ve gone before, including to the vicinity of the Moon and Mars. Named after one of the largest constellations in the night sky and drawing from more than 50 years of spaceflight research and development, the Orion Spacecraft is designed to meet the evolving needs of deep space exploration program for decades to come. Orion deep space exploration missions, coupled with record levels of private investment in space, will help put NASA and America in a position to unlock the mysteries of space and to ensure this nation’s world preeminence in exploring the cosmos. At NASA’s Michoud Assembly Facility in New Orleans, technicians with Orion prime contractor Lockheed Martin welded together the first two sections of the Orion crew module for Exploration Mission-2, the first flight of Orion with astronauts which will carry them farther into the solar system than ever before. The crew module, or pressure vessel, is the primary structure that holds the pressurized atmosphere astronauts will breathe and work in while in the vacuum of deep space and is the structure upon which all the other elements of Orion are integrated. The systems for thermal protection (the heatshield), propulsion (attitude control), and landing and recovery (parachutes and flotation) are attach to the outside of the pressure vessel. It has been designed specifically to withstand the harsh and demanding environment of deep space travel, while keeping the crew safe and comfortable. Most of the time, a sea-level atmosphere in the pressure vessel will be maintained for the crew. Inside the pressure vessel are areas for crew systems such as flight controls, communication and information systems, seating, storage for food, clothes, and equipment, a galley, and a toilet. 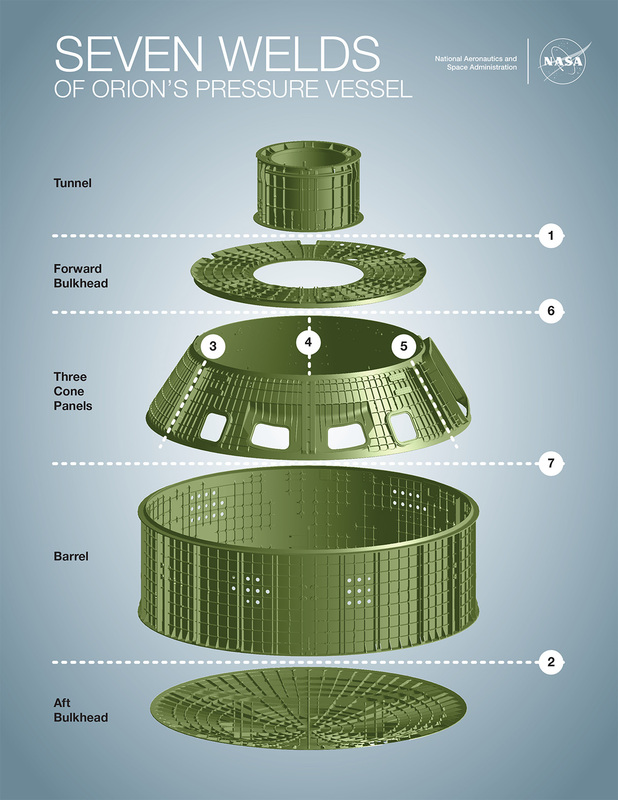 The main structure of the pressure vessel is comprised of seven large machined aluminum alloy pieces that are welded together to produce a strong, yet light-weight, air-tight capsule. The first weld joined the forward bulkhead with the tunnel section to create the top of the spacecraft. Prior to the critical first weld, engineers prepared and outfitted each of the two segments with strain gauges to monitor the reaction of the metal during the procedure. The bulkhead and tunnel were welded together with a state-of-the-art process called friction-stir welding, which produces an extremely strong bond of the two aluminum components with a uniform welded joint. Separately, the bottom of the barrel will also be welded to the aft bulkhead. Before the final weld, the other major structural component will be added to the aft bulkhead, called the backbone assembly. The backbone assembly is a bolted structure consisting of nine pieces that are assembled prior to being installed inside the pressure vessel. The backbone is also bolted into the welded aft bulkhead/barrel assembly. Once completed in September 2018, it will be shipped to the Kennedy Space Center where it will undergo assembly into the EM-2 spacecraft. The Exploration Mission 2, or EM-2, is a scheduled 2023 mission of the Space Launch System and possibly the first crewed mission of NASA‘s Orion spacecraft.